By using this website, you agree to our use of tracking cookies. You can change your tracking cookie settings here. A software update is now available that makes several adjustments to enhance the overall experience. This software update is required to transfer Pokémon to Pokémon Sun and Pokemon Moon. The software version after this update will be 1.3, as shown in this image. Makes Pokémon Bank compatible with Pokémon Sun and Pokémon Moon. 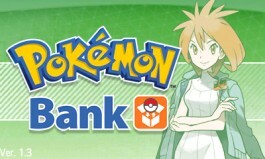 For more details, please visit Pokémon.co.uk's official Pokémon Bank website. You can download this software update by scanning this QR Code with your Nintendo 3DS system cameras. For instructions on how to scan a QR Code, please visit our Downloading Nintendo 3DS software updates section. QR Code is a registered trademark of DENSO WAVE INCORPORATED. The update data will be saved on the SD card inserted in your Nintendo 3DS system. If there is insufficient free space on the SD card, the update will not be applied successfully. You can check how much free space there is on your SD card by opening System Settings from the HOME Menu and selecting Data Management. Please take care not to delete the update data, which can be viewed by opening System Settings → Data Management → Nintendo 3DS → Add-on Content. You are about to leave the Nintendo of Europe site. Nintendo of Europe is not responsible for the content or security of the site you are about to visit.